Artist Jerry Robinson, who created The Joker: "We're looking for heroes"
LOS ANGELES, California (CNN) -- America faces an economic calamity. Trouble brews in faraway lands. Superman #14, cover art. Artist: Fred Ray. 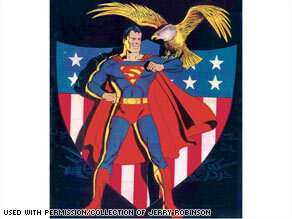 (c) 1941 DC Comics. All rights reserved. More than 70 years ago, the very first superheroes debuted in the dire times of the Great Depression and the early years of World War II. Their names became legend -- Superman, Batman (or, as he was then known, the Bat-Man), Wonder Woman, Captain America -- and they're still with us today. A new exhibit at the Skirball Cultural Center in Los Angeles celebrates these icons from the Golden Age of Comic Books. Through a collection of rare original artwork and comics, the exhibit explores how a group of mostly Jewish artists created the costumed heroes who came to symbolize the hopes of a beleaguered nation. "We were just emerging from the Depression," Robinson recalls. "Superman started in 1938. Batman started in 1939. So, we were just recovering." Robinson says the villains changed with the times. "The first villains in the comic books were hijackers, embezzlers, bank robbers. It was the era of Pretty Boy Floyd and so forth. Once the war came along, we felt a need for more patriotic heroes to fight Hitler. "In fact," he adds, "Hitler banned American comics, at least Superman and superheroes. He said they were Jewish. Little did he know that the creators were actually Jewish. ... Hitler banned American comics, except one: Mickey Mouse, which was his favorite." One of the highlights of the collection is Robinson's original sketch for The Joker. "My first thought was that a villain who had a sense of humor would be different and memorable," he says. "So, I'm thinking of a name for a villain that has a sense of humor. I thought of 'The Joker' as a name, and as soon as I thought that, I associate it with the playing card, as my family had a tradition of champion playing; my brother was a contract champion bridge player. There were always cards around the house. "So I searched, and luckily it had the typical image of the joker, which came out of a tradition in Europe. This was an important element. Throughout history, we had court jesters, clowns, and so this was an iconic image that was also very useful." In our own times, the public is turning to costumed heroes again in record numbers. Movies based on comic books are box office leaders; comic books themselves remain a strong and growing industry. "I think the comic book superhero came out of a context in which the political, social and economic realties were a little tough," Clancy says, "and we can certainly relate to those realities now in our own day. I think the resurgence of popularity of superheroes can be attributed to that." Last year, audiences made "The Dark Knight" the second-highest grossing film of all time. The late Heath Ledger, who won a best supporting actor Oscar for his performance as The Joker in that film, spoke with Robinson before he died. "I was flattered to hear from him that he based the whole concept of The Joker's persona and rationale on our first concept of The Joker," Robinson says. With the box office success of "The Dark Knight" and "Iron Man" -- plus comic book-inspired films like "The First Avenger: Captain America," "The Avengers" and "Thor" in development -- it looks like superheroes will continue to inspire. "I think heroes are back," Robinson says. "I think you can almost chart it. The times are not so good -- we're looking for heroes." All images and characters copyright DC Comics. DC Comics, like CNN, is a unit of Time Warner.